I often run into necessity to load data from sources published in the Internet. In most cases the sources are RESTful web-services, thus the data they emit is in xml or json formats. More and more web-services providers prefer spreading their data in an easier-to-use REST formats as a simpler alternative to SOAP and WSDL based web-services. For downloading data via the Http protocol I implemented a set of generic classes, let’s call it WebLoading Library. Almost every class in the library is a loader, which operates at a certain level of abstraction. The library allows to easily derive a new class from one of the exposed loaders, defining a type of the data to be loaded and the type of the ready-to-use data to be returned out of the loader. See the class diagram below. I single out such basic steps of getting data as raw data loading, verification and conversion into a ready-to-use view. 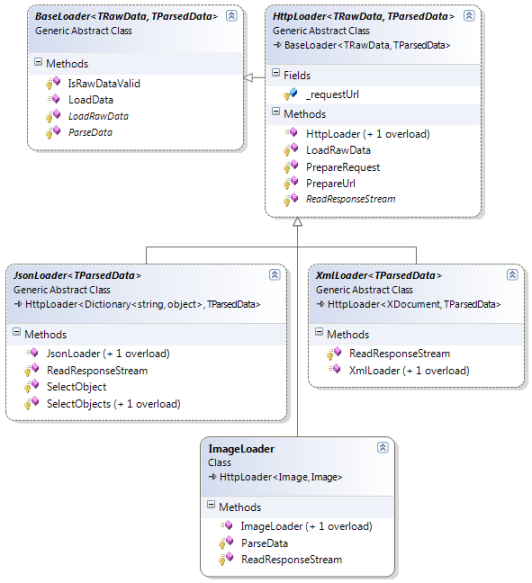 All loaders exposes the LoadData method aimed at performing these steps.The listing below demonstrates the LoadData‘s base implementation in the BaseLoader class. BaseLoader is a root base class for all loaders in the WebLoading Library hierarchy. /// Abstracts the data loading from a specified source. Provides such basic steps as data loading, verification and interpretation. /// Loads data from a specified source, verifies it and returns its ready-to-use view. BaseLoader abstracts the loading from any source. Unlike BaseLoader, its direct descendant, HttpLoader, implies loading from a source supporting the Http protocol. See the listing of the HttpLoader class below. /// Abstracts the data loading from a specified source using Http. Provides such basic steps as data loading, verification and interpretation. /// Does nothing. Just returns a loaded image. /// Abstracts the xml data loading from a specified source using Http. Provides such basic steps as data loading, verification and interpretation. /// Abstracts the json data loading from a specified source using Http. Provides such basic steps as data loading, verification and interpretation. Pay attention to the SelectObjects methods that obtain an specified object(s) from a tree of arrays and dictionaries using a xpath-like path (for example, “set/items/item”). The source code and examples are available to download here. In SharePoint 2010 by default a list item is opened in a Modal Dialog Window. The dialog adjusts its size depending on the size of the contained content and provides users with buttons to maximize and close itself. So, I was asked to maximize the dialog when opening some list items. The commented line demonstrates one of the possible settings, showMaximized, which apparently does exactly what we need. So, it would be a good solution if we had control under creation of the dialog. Unfortunately, we don’t have. Modifying scripts in SharePoint system js-files runs counter to all known “best practices”, therefore I don’t even consider it. Another possible way is override the client-side OnClick-events of the link-title fields everywhere (in list views, web parts and so on) so that your own script would create and display the dialog in a required manner. Obviously, it’s a very time-consuming solution. Moreover, every time when creating a list view, web part or something else you always have to keep in mind the possible need to rewrite their OnClick-events. In my opinion the only acceptable approach is allow a web page itself to maximize the dialog window it’s placed in. _maximizeWindow gets the current dialog window instance and tries to maximize it if it hasn’t been done before. ExecuteOrDelayUntilScriptLoaded, in turn, is applied to ensure the _maximizeWindow is called after the sp.ui.dialog.js has been completely loaded. You may ask why I use RegisterClientScriptBlock instead of RegisterStartupScript or window.onload, or jQuery‘s $(document).ready (the latest two arise on client side). The reason is that initially the dialog window is created with the autoSize option. So, it’s very reasonable to maximize the window as soon as possible to prevent the content’s size calculating, which apparently happens after the page has been loaded entirely. "The field cannot be deleted because it is a read only field in the list." "The field cannot be deleted because it is a sealed field in the list." "The field cannot be deleted because it is a hidden field in the list." and other. So, let’s consider how these difficulties can be overcome (if it’s possible at all). *Note: this code is true for both SharePoint 2007 and SharePoint 2010. As we can see, deleting a list field, SharePoint explicitly analyzes such properties of the field as AllowDeletion, Sealed and FromBaseType. Additionally, experiments show that the ReadOnlyField and Hidden properties are being examined as well (likely it happens somewhere in the unmanaged SharePoint modules). // check if it's a ReadOnly field. // check if it's a Hidden field. // check if the AllowDeletion property is set to false. // the Sealed property seems not to be examined at all. // So the following piece of code is commented. // the FromBaseType property seems not to be examined at all. *Note: the GetFieldByName method is described here – Getting SPField with no exceptions to be thrown. According to the code of the CanBeDeleted, the Sealed and FromBaseType properties are not being examined at all while the AllowDeletion is set. Thus the dealing with them is commented, but retained just in case. *Note: the GetListByUrl method is described here – Getting SPList with no exceptions to be thrown. The RemoveField method isn’t a panacea. For example, you still will have problems if the field going to be deleted is a part of a multiple column lookup. Be very careful when deleting fields, because it can lead to severe issues in your SharePoint applications. If you are uncertain, don’t delete anything, especially if it concerns a live application on a production server. Remember that you are always able to just make the field hidden instead.